让发展中的CAR-T细胞技术平台进入更快的发展 - Powered by Discuz! In this issue of Cancer Cell, Zhao and colleagues test various chimeric antigen receptor (CAR) T cells to show that CD28-CD3z CAR T cells that constitutively express 4-1BBL promote T cell expansion and tumor eradication while reducing exhaustion. The results have important implications for the development of effective CAR T cell therapies in cancer patients. 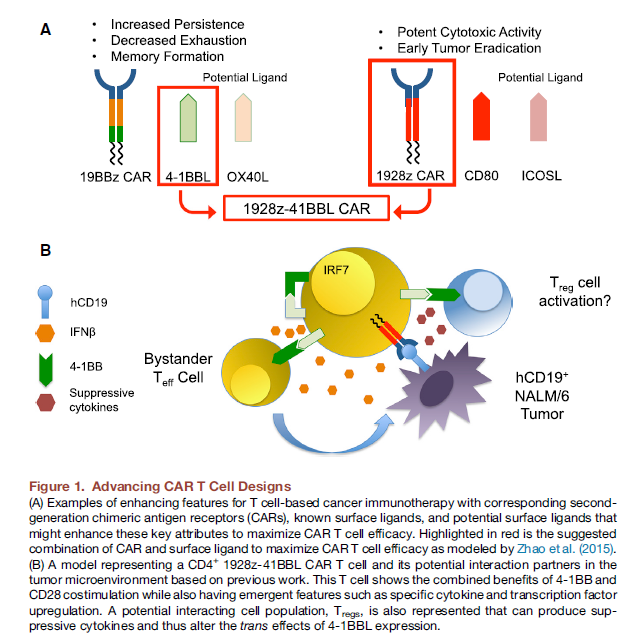 (A) Examples of enhancing features for T cell-based cancer immunotherapy with corresponding secondgeneration chimeric antigen receptors (CARs), known surface ligands, and potential surface ligands that might enhance these key attributes to maximize CAR T cell efficacy. Highlighted in red is the suggested combination of CAR and surface ligand to maximize CAR T cell efficacy as modeled by Zhao et al. (2015). (B) A model representing a CD4+ 1928z-41BBL CAR T cell and its potential interaction partners in the tumor microenvironment based on previous work. This T cell shows the combined benefits of 4-1BB and CD28 costimulation while also having emergent features such as specific cytokine and transcription factor upregulation. A potential interacting cell population, Tregs, is also represented that can produce suppressive cytokines and thus alter the trans effects of 4-1BBL expression. GMT+8, 2019-4-26 16:39 , Processed in 0.173371 second(s), 32 queries .